PS- don't forget to enter the Pillow Giveaway! Love them! what a great find! OMG, I die. I freaking love quatrefoil patterns more than life (okay, I'm being dramatic, but seriously). Amazing find! Where did you get them? Love quatrefoil and these will look amazing next to your mirror!! Can't wait to see it come all together! Kristin and Janell- they are from the Goodwill- just a lucky find. Erika- that is awesome, what a great friend!! Those will look great flanking your mirror! I love exploring lighting sources--please do share where you found them!! love..can't wait to see how they turn out. super duper find!! Those are a great find and will look fabulous next to your mirror! its from the movie annie! Miss Katie- Bonus points to you!! I love that movie! Way cool find - I'm assuming you'll post "after" pics, once they're up?! wow! i love them. can't wait to see the pics! Beautiful! what an insanely lucky Goodwill find! Oh so jealous. Please take a picture as soon as they are up! Oh those are going to look so good! love both Linds, great picks!! Oh my...I WANT your sconces! Where oh' where did you get them!!???? LOVE! Annie! (I know I'm late in answering) I love that movie! I think they're going to look great! I can't wait to see the sconces hanging up! They are so much fun and I love the quatrefoil pattern. Those sconces are great finds! 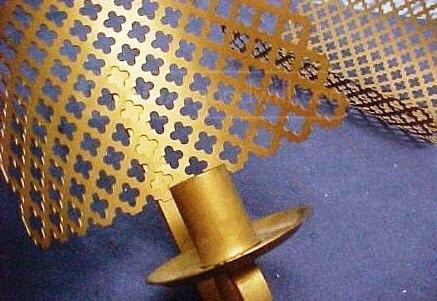 Totally love the quatrefoil cutouts of course. i used to perform annie as a one woman show when i was 9. that should come as no surprise to you though.